(https://www.hrperspectives.org/).The initial interview covered legal classifications for work performed, https://www.ctrchg.com/0002-wwc-are-you-a-solopreneur-or-an-employee/, and assessing if one is a solopreneur or actually an employee. In his second interview, https://www.ctrchg.com/0011-wwc-human-resource-law-jeffrey-cochran-interview/, Jeffrey told us about the importance of complying with Human Resource Laws and some of what to watch for. Today’s podcast was recorded at the gym Jeffrey owns where he takes work-life balance seriously…encouraging his clients to take complete care of themselves, not just their business. This can be tough when, according to Elon Musk, “You have to put in 80-100 work-weeks.” With that approach, though, the solopreneur/entrepreneur is going to burn out. That is why Jeffrey recommends stepping back and structuring a work-life balance. Jeffrey referred to an Inc Magazine article referencing an study stating that employees who felt they had a good work-life balance were 21% more productive. That 21% boost not only supports getting more work done it also creates a space for working out and taking care of oneself. 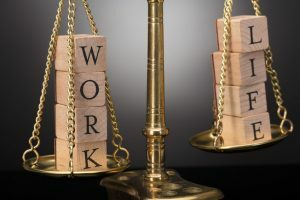 He also referenced another study by SHRM (https://www.shrm.org/), the Society for Human Resource Management, stating that 25% of people who feel they have no work-life balance plan to leave that company – a number that becomes increasingly significant as the size of the company gets smaller and smaller. On the flip side, the same study saw an increase in employee retention of 89% when there were flex hours and a greater sense of work-life balance. Applying for loans from the Small Business Administration (https://www.ctrchg.com/0003-wwc-small-business-financing/ and https://www.sba.gov/) life-style is one of the areas addressed. They don’t want to loan money to someone on the edge based on over-extension. mandatory sabbaticals. Cell phone off, locked out of the system for that period of time. This also helps prevent fraud by being able to see if there are behavioral changes in the organization when someone is on sabbatical. at the individual level, let go of responding immediately to everything. Use a “24 hour” rule stating you’ll get back to the person within 24 hours. gauge the value of each activity. Was it worth missing your anniversary dinner with your spouse? When was the last time you actually hung out with friends? when you’re not fresh can you actually do damage when trying to stay on top of everything? The fact is mentioned that when one pushes to hard and over-stresses the brain gets rest by shutting down portions at a time, rotating what part is “down” at any given time. Pushing to work at this time is a formula for disaster. discipline in terms of calendar management is critical. Jeffrey references Ben Franklin a lot because his methods for managing one’s life are still applicable today. Franklin addressed his attitude along with the actual events on the calendar. Remember to include some flexibility so that there is contingency time available for the inevitable unforeseen events that occur. Jeffrey includes what he calls “study hall time” so there is space for him to invest in himself and his business. He uses it to read articles he’s bookmarked on the internet and other such activities that, when allowed to interrupt flow through the day, can be detrimental. Make sure to include personal events as well so they don’t become forgotten after-thoughts. Comparisons are made to the European approach to work schedules. Jeffrey offered a great term! PDT…Productivity Dense Period. Gary referred to Twyla Tharp’s (https://www.amazon.com/Creative-Habit-Learn-Use-Life/dp/1480589837) advice to save 10% each day for the next. By consuming all of one’s energy on one day, or even over-extending, the odds are high that the next 1-3 days will have low productivity. Jeffrey referred to a habit DaVinci had…simply taking naps throughout the day when swamped with work that had to get done. Separating home and work can help with work-life balance. If working out of the house use a separate space that is detached from all the home-life activities, such as laundry, that can be tempting to perform but which take away from the PDT. Be able to shut the door and just focus on your work. Turn off e-mail notification and anything else that can generate asynchronous interrupts which can break your train of thought. Schedule when to deal with them. Remember, every focal point in your life is present in the house, potentially making it difficult to work. Get up and get dressed for work. Even if working out of the house sometimes a shirt-and-tie approach will help one focus. Co-working spaces are another option where, for a reasonable fee, a drop-in desk can be used providing a work destination. It can also be used as a mailing address plus give one access to high-speed internet. If no space is available consider contacting your Chamber of Commerce and see if they will support starting a co-working space. Isolation is discussed. It is important to keep in mind how the degree of isolation can affect one’s ability to work. The loss of social fabric by being working alone can not be over-stated. It’s one of the main reasons people leave working on their own. Jeffrey talks about his experience as co-owner of Reform Total Fitness and how people will say, “I don’t have time to work out!” …but they had time to watch “Game of Thrones” for 3 hours! Jeffrey refers to Tim Ferriss (https://tim.blog/) and how in his interviews with business leaders over 80% meditate. Also, As the level of distraction goes up and the belief there just isn’t enough time then, while seeming counterintuitive, it is better to meditate more in order to maximize focus and productivity. Jeffrey references an article in the Harvard Business Review entitled, “Why Some Men Pretend to Work 80 Hour Weeks.” It addressed the fact that managers couldn’t tell the difference between people that worked 80hours/week and those who pretended to work 80 hours/week.